Do you ever consider totally reinventing yourself? I'm trying to reinvent myself this year, as my Motherhood intensive years draw to their natural conclusion with my daughter heading towards the end of her school life and her 18th birthday. Hollywood folk do it all the time. Of course they have endless money and stylists at their beck and call, but we mere mortals can manage on lesser fodder. Let's take Robin Wright. She of The Princess Bride in decades past, and House of Cards more recently. She is one of my favourite actors, and a wonderful example of someone who has played a wide range of characters, demonstrating exactly the difference a hair colour, a change of hairstyle, and a bit of wardrobe help can make in the process....even if manufactured by Hollywood. I could not at first believe that the woman I was watching in House of Cards (above), was the fresh faced beauty I knew and loved in The Princess Bride (below). It was hard to believe. She looks so very different. There alone, is the proof that a few kilos off and a haircut can turn you into a whole new person! But even more interesting is this little collection found on Pinterest, of Robin Wright in some of her other film roles. As someone who recently re-watched the film The Pledge, where she co-starred alongside Jack Nicholson, I can vouch for the fact that I did not pick that character as the same woman either. In addition to her consummate acting skills, Robin Wright seems happy to be magically transformed into many different personas, with or without bad hair days, and dental issues. She is not beautiful (or so my husband tells me....I think she is) in that typical Hollywood style, but she is arresting, no matter the character she is portraying. But I digress. The middle image, showing her in her role in The Pledge, could be me on a (very) bad day. I do not have a chipped front tooth, but I have certainly dyed my hair a similar colour, and been guilty in my more awful moments, of dressing down, if only to avoid attention. It hasn't happened often, but we are all only human. Relationship breakups, grief and financial worries have all seen the best of us having more than just a bad hair day. But look at the other photographs by comparison. This is the same woman remember. And no matter how she wears her hair, or what she is wearing in other roles, she shines, because she (or her character) looks like she cares. Yes, yes, I know it's a role she is playing, and there are stylists involved. I get that. 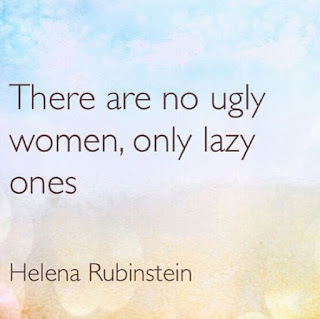 But the point I am trying to make is one that Helena Rubenstein, makeup entrepreneur herself made, many long years ago. And I would add exhausted women, stressed women, financially bereft women, women who put everyone else before themselves because they believe that makes them a better person, women who would go without food never mind a haircut if it meant their children could eat. But those are extremes. And I'm just talking the day to day grind. We all get lazy sometimes. I do too. The heat, the cold, a few sleepless nights for whatever reason, busy family times, and the aforementioned grief, and worries, take their toll on all of us. But overall, those very few times notwithstanding, I have found that in my own life, how I look, was the one thing I could control, even when other things were spiralling manically. When my son was diagnosed with Cerebral Palsy, when my Mum was terminally ill, when I had more debts than money to pay them, yes I had the odd 'off' day. But MOSTLY, I got up, decided that if nothing else, I could look nice, and made the effort. Believe it or not, it helped. It still does. Look in the mirror. Really look. Yes it's hard to do that sometimes, isn't it. Mostly we give our reflection a cursory glance to check that tags on shirts are in, and hems aren't falling down. We do not often really evaluate ourselves. I asked you to do this at the start of the year, and I know that many of you found it a confronting task. Can I suggest that it is only confronting because you feel you will not like what you see? Let's try to remedy that. How is your skin? We all have imperfections, so don't focus on that. Just how is it overall? Smooth? A few lines? A few little broken capillaries? Eyebrows, do they need tidying? Or dyeing for emphasis? Neckline and décolletage...would a lush moisturiser give those areas a healthy glow? Hands and arms...could they do with a bit of an exfoliating treatment and some Body Butter? The cheapest exfoliating treatment is to dry off with a rough towel. I have a towel that I deliberately spin on a lower speed in my washing machine. I then lay it out in the sun to dry, and it dries a bit crisp. I then use this to dry off. It's invigorating and gets rid of scaly dry skin on legs and feet too. Back to looking at your reflection. Is your hairstyle and colour flattering? Is your hair well conditioned and soft? Just having beautifully conditioned, shiny, healthy hair can make a huge difference. Make sure you're getting your Omega 3 oils, found in salmon, avocado, and walnuts to name a few. It's as much about what goes into your body as what you put on your skin and hair, that truly makes a difference. Are you still wearing the same hairstyle you wore 30 years ago? Could a visit to a hairdresser see you losing years in the snip of a scissor and the goodness of a moisturising masque? Could a half hour spent browsing hairstyles on Pinterest see you with a new and youthful hairstyle, knocking 5 years off your true age? Maybe just experimenting with a new up-do would lift your spirits too. Try sleeping on a silk pillowcase to avoid bed hair. Curly hair is terrible for bed hair. I used to have to wash my hair daily, just so that I didn't look like I'd just woken up. A silk pillowcase helps enormously. I love Annabels suggestion over at The Bluebirds are Nesting. She told me years ago, to look out for silk scarves at the thrift stores. She turns those into gorgeous silk pillowcases for just a few dollars. Annabels blog is on my side bar on your right. She's a wealth of wonderful lifestyle tips. What about your teeth? Uncared for teeth, age us almost more than anything. I hate the dentist too. But I go annually if just for a checkup and a clean. That alone makes a huge difference. My dentist is lovely, and there is rarely, if ever, pain involved. If you haven't been for a while, do that, for yourself. Try using a whitening toothpaste. Colgate Optic White is my personal favourite, and when it's on special at my supermarket, I make sure I stock up. It's one of those products that truly does work. Floss? I used to be a bit lackadaisical about flossing. I'd do it if I remembered. Then my dentist told me that failing to floss, means you actually have decaying food between your teeth. Eeeeeeyew, right? That certainly motivated me to be more fastidious about flossing! This makes for lovely fresh breath too. Let's face it. Nobody wants Dragon breath. Am I right? Think about your skin care and makeup routine? Have you adjusted makeup for a fresh, current look? If you're not sure, visit any department store and see available now for your skin, your colouring, and your lifestyle. Update your skincare products if you can. I'm not talking Botox and needles here, just a fresh look at self, and the thought that maybe what suited you 20 years ago, isn't doing you any favours now. Or that maybe a dust of mineral makeup and a clear mascara would hide imperfections and open your eye area, giving you a youthful look. My makeup nowadays, consists of a Mineral makeup powder, eyebrow colour, light mascara, and neutral lip colour. A bit of gloss is a great idea for a dewy look too. A smear on the brow bone, the top of the cheekbone, and on the centre of the lips is always flattering. Achieve it with a pearlised powder, or a dab of Vaseline. Both will work. Invest in a skin care regime, even if it's the most basic one. Sorbolene makes great cleanser, removed with a clean, warm cloth or muslin square. And there are plenty of budget friendly options for lotions and potions to keep your face, neck and décolletage looking fresh. From Loreal to Le Roche Posay, there's something for everyones budget. The best tip for great skin? Drink water, and limit alcohol and caffeine. Try drinking nothing but water for 48 hours, and watch how clear your skin is, and how bright your eyes. I promise! Step back now, and find a full length mirror and observe what you are wearing today. How do you look? Are you wearing a colour that makes the most of your features? Is your outfit accentuating your best assets, and camouflaging the lesser ones? You might not be the kind of person who fusses about clothing. But can I tell you a story? In my younger days I had a French boyfriend, Phillipe. Like many men, and particularly French men, he was very particular about his own appearance, and subsequently, mine. This was back in the day when I was a slip of a thing, and could wear whatever I liked. Well. One day I was getting ready to go grocery shopping, and I put on a brand new Velour track suit. Those were all the rage at the time. Poor Phillipe nearly had apoplexy. He said to me 'You cannot wear zis fing! It iz not nice for people'. Translation....'you can't possibly be serious about wearing a tracksuit in public. You will offend the eye of everyone you meet'. He was genuinely horrified. I didn't even really understand what he meant at the time. I just shrugged, thought that if he felt that strongly about it, I'd wear something else, and remained puzzled for a time. I read a book much later, written by an Australian woman who moves to Paris for her Beau, and relates a very similar incident, where her French fella berates her with 'Eet iz not nice for ze baker!'. Then I travelled to Paris myself, and witnessed first hand, that whilst everyone isn't swanning around in Couture garments every day, they certainly are a well dressed lot, and not a velour track suit in sight! They care. They look like they've taken time over their outfit. Their shoes are in good repair. They carry quality (not designer) handbags and wallets. There is just an air of class, in the way they present themselves. Every day. Not just on work days, or for special occasions. So maybe if you won't do it for yourself, which is a whole new topic, maybe think about doing it for those around you. Your partner, your children, your friends, and the people with whom you interact daily. Make THEIR day, by making an effort with the way you look. Imagine the smiles and the conversations and memories that could ensue. In my suburb, we still fondly remember some twins that turned up regularly at the local shops, dressed like Marilyn Monroe. Another lady always wore a fabulous hat, even when just at the fruit market. I personally know two ladies in their 80s, who wouldn't be seen without their winged eyeliner, and red hair. I love that there are still women in my city, who dress for the theatre, the races, and coffee at the local bistro. There is absolutely nothing wrong with injecting a little old fashioned glamour into your life, and the lives of those around you. I don't always agree that 'doing it for yourself' is enough to motivate us. If that works for you, then go for it. But sometimes I think we fall back on 'I don't care what people think', when really what we mean is 'I don't care any more', and that is terribly sad. If you find that upon reflection, you are falling into the 'I don't care anymore' category, then maybe it's time to start caring. If you suffer with an illness or depression, I know that can be very hard. But it's not impossible, and can actually impact your life positively. See your doctor too, and enquire about supports for your condition. There may be many things from alternative medicine, to networks and online groups that can help you see light at the end of the tunnel. Finally, a bit of exercise is a good thing. Again, I do not advocate long gym sessions or overkill in this area, unless you love it. A gentle walk every day is good for heart health, glowing skin, and general wellbeing. I know it's hard when it's raining, or snowing, or hot and humid. Those are the times when I fall back on my yoga DVD's or a bit of dancing to my old favourite tunes. What are your exercise tips? Over the next three months, let's all try to reinvent ourselves. I feel like I have made lots of progress on the wardrobe front. Now it's time to start tackling a freshen up of self. Lose a few kilos, decide whether I need a new hairstyle, eat more Omega 3s, drink more water. Let's report back at the end of July, and see how we look and feel. Cor blimey............... are you reading my mind?! Right now I am going through the process of packing my bag, sorting, culling and matching - attempting to arrange a travel wardrobe that will cover walking in national parks, a night out in Las Vegas, staying in an old saloon and so forth. As it is an extended road trip involving a great deal of walking, comfort is an issue. But I also want to look good. What you raised in today's post, I will be addressing on my return! I am with you, I am recovering from a major illness and came out feeling not so attractive, I have always taken care of myself as far as wardrobe hair and make up. I think this will be fun. Looking forward to future posts. Hopefully by July I hope to have finished the majority of my treatment. I am changing and evolving everyday. I will be a better version of myself. I am doing Charm School over on my own blog. I'd decided last month that May was the month to have a sort of bootcamp(intensive study period) on what makes a woman smart and good looking. I too am a casual type and I make no apologies for that. I don't go to theatre nor symphony etc but neither do I live in yoga pants and t-shirts. If I am only going to the grocery I try to smarten up for it, even in our local town where too many people not only don't make an effort they are almost hostile those who do! I have embraced my gray hair, found a hairstyle that I really like and have stuck with now for two years which is some sort of record for me. I've spent this week exploring my body type and find I'm in fair shape where my choice of styles go. My body shape hasn't changed much over the years. I've always been pear shaped and pear shaped I am. Love this whole series this year and thank you for sharing! Yes, I will be more mindful of what I eat, drink and wear and put my best foot forward. This comment is from Jody. Jody, I inadvertently deleted your comment instead of publishing it, so I've copied and pasted it from my email. Sorry! This whole attitude is just how it felt most people embraced all threw my growing up years. It is just a way of life..the way you lived. Our neighbor almost had a heart attack when my sister came out onto our porch in shorts and barefoot one day! Dressing nice was not a chore it was just part of life. No matter how little you had to pay for clothes those clothes were never worn sloppy and always fresh and pressed. People had pride in their appearance They felt you represented your whole family to the world,.. let alone your school, town and of course your church and God . Who would want them to think less of those by dressing down in any way? It is rather hard to explain but I wish I saw more of it now a days. 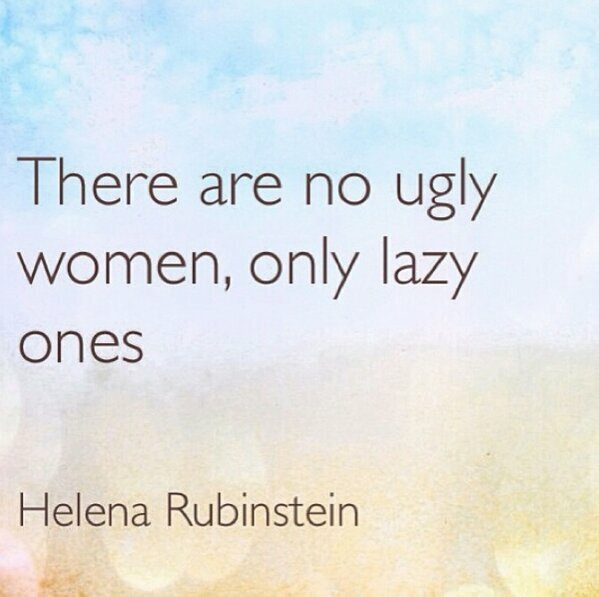 We can each only do what we can and hopefully inspire others to care more about their appearance. Jody"